Not gonna lie, I've been waiting a long time for this book. It finally came out this week. Can't wait to get my hands on it and read it. 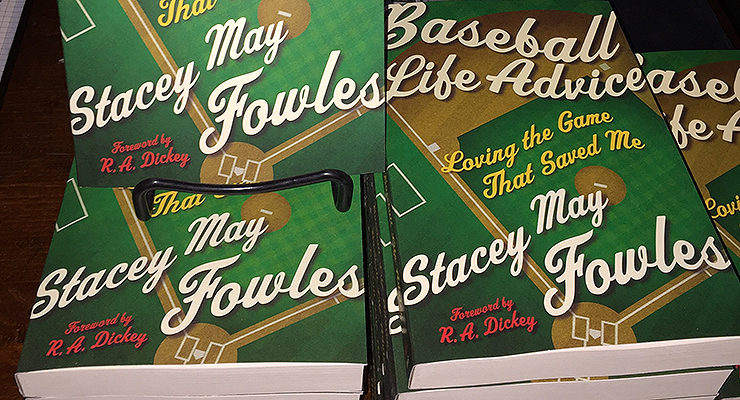 I first subscribed to Stacey May Fowles' newsletter, Baseball Life Advice, in September 2015. The writing was so fantastic that I have a folder that contains every one she has written since. I found myself nodding along to so many things she wrote, so many of her experiences mirroring mine, appreciating how she saw baseball as it connected to life, that I needed to be able to go back and read them again. If you've read her writing on BJN you have a strong sense of what her style is like. Hopefully she won't mind me sharing a bit of one of my favourite newsletter pieces. I have no idea if it's in the book or not, nor is this the whole essay. Just the part that means a lot to me. I think you can guess when she wrote it. Right now, there are some joyless blowhards taking the time to comment that the Jays don't really have a right to soak themselves in beer and bubbly after squeezing their way out of a situation that at times looked totally dire. "They haven't done anything yet," they say, while living their hateful, miserable lives that lack all empathy, levity, perspective, and unabashed enthusiasm for the simpler things. I'm sorry, but were these people in a cryogenic chamber for the past month? Have they been living in a baseball-less cave in the mountains somewhere and suddenly just popped out into the light of day to say, "I can't believe these guys are smilingly donning novelty goggles and dumping copious amounts of Bud Light on each other?" SEPTEMBER WAS THE ABSOLUTE MEANINGFUL-EST WORST WHEN IT CAME TO BASEBALL, PEOPLE. I MEAN, I LOST THE ABILITY TO PROPERLY FEED AND DRESS MYSELF. THIS VICTORY IS A BIG DEAL. DAMN RIGHT WE SHOULD ALL CELEBRATE. There's this weird and pervasive cultural force that consistently discourages us from having even a tiny little proud party to fête our personal victories. It's a nefarious external judgment that keeps us down, and asks us to say things like, "Oh, it's really no big deal," when inside we actually can't believe we achieved something so monumental that once seemed so far off. It's a voice that instructs us not to bat flip of fist-pump when we finally gain what we've put in a whole lot of hard work to acquire. It says we should be "cautiously excited," whatever that means. I'm sorry, but if you slogged it out through your own version of 162 games, or approximately 500 or so hours of playing time to get to where you ultimately want to be, of course you should take a fun moment to honour that work. There are ten teams in the postseason and you're on one of them. It's okay to be proud. It's okay to be happy. It's okay to feel genuinely celebratory about all that you've done. If this interests you, you can purchase a copy using the JITH affiliate link or the link from Hum and Chuck (Joanna was how I found out about Stacey May and her newsletter in the first place). Support whichever site you'd like. I hope you love it as much as I will.